Home Hospital Beds: To Buy or To Rent? Cesarean sections account for close to 30 per cent of live births in Canada. They’re performed for various reasons– some c-sections are elective and others help to avoid possible complications with the baby or the mother. What very few women know until they leave the operating room, is that c-section recovery is not only painful, but it also limits your range of motion. Doctors often recommend that you don’t lift or drive for four to six weeks post-partum. One great device to help you rest and relieve the pain in your abdominal area is a medical lift chair rental from Vital Mobility in the Toronto area. During a c-section, doctors cut many layers of skin, fat and supportive tissue. Even though the procedure under local or general anesthetic is painless, once those layers are sewn back together you will be recovering from major abdominal surgery. The mere acts of standing up from your bed or a chair and finding a comfortable position to feed your child will be challenging. That is why, the medical lift chair, with it’s unparalleled ability to recline (offering incredible comfort) and assist you to an almost-standing position, will help to take much of the pressure off your healing body. Lift up to standing and help you sit down: With the simple touch of a button, a lift chair can give you the support you need to slowly and painlessly lower your body down to a sitting position independently. That same motion, in reverse, will help to take you all the way from a fully-reclined position up to an almost vertical standing stance. Imagine soothing your child or even sitting down with a book or tablet knowing that you do not require assistance to do so! Ideal for feeding baby: Breastfeeding in particular, can be challenging while recovering from a cesarean. Your abdominal muscles are weak, making you more prone to assuming an uncomfortable, hunched over posture that can lead to muscle tension. The reclining lift chair’s back can go as far back as you need it to, and it’s leg rest comes up to a horizontal position. The lift chair is the perfect device to help you find a great feeding position that will work for both you and baby. Nighttime Sleep: After undergoing a c-section and returning home from the hospital, finding a comfortable position to sleep in can be a challenge. Turning in bed will be painful, as will standing up to use the bathroom or to feed your child. Many Vital Mobility customers, especially in the first few days after the procedure, will sleep on an infinite position lift chair– which allows you to recline all the way back to a sleeping position. 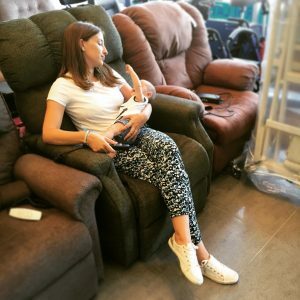 Not only can they find a cozy spot to rest on, but by placing the baby’s bassinet next to the lift chair, they’ll be able to bring themselves up to sitting with not trouble at all. If a c-section is part of your birth plan, the Vital Mobility family is always available to help you ready a great lift chair for rent for your return home from the hospital. Moms undergoing emergency c-sections need not worry either, as our team can deliver a lift chair to your place the next day after you call.